If you have kids and they are in the dinosaur stage then they will love to visit the Dinosaurs In Cabazon, CA. It is right off Interstate-10 just about 30 miles north of Palm Springs. There is so much for the kids to see and do but I know they will get a kick out of crawling inside the huge Brachiosaurus through its tail and see the amazing store inside. This is a photo of a window opening with some bars. It is from the hotel in Palm Desert. Have you ever visited the desert and looked for those cactus trees that they show in the cartoons but seen something similar to the one above? The desert is funny like that because there are so many different types of deserts and so many different living creatures and plants within them. The one above is called the Joshua Tree and if you have never been to Joshua Tree National Park then you are missing out! It is amazing with all the scenery. My wife and I went on a weekend getaway on Labor Day back in 2003 and we did some hiking! We tried to get higher and farther than we did but my old Dodge Neon wasn’t cooperating too much off road. We just explored the mountains as we approached Shaver Lake which was nice but we wanted to go higher. We then finally approached Huntington Lake which was also nice but we wanted to go farther. We couldn’t go any further because the day was ending and we needed a place to camp. We setup camp there and decided to go up higher the next day. We looked at the map and we seen so many places that we wanted to see. 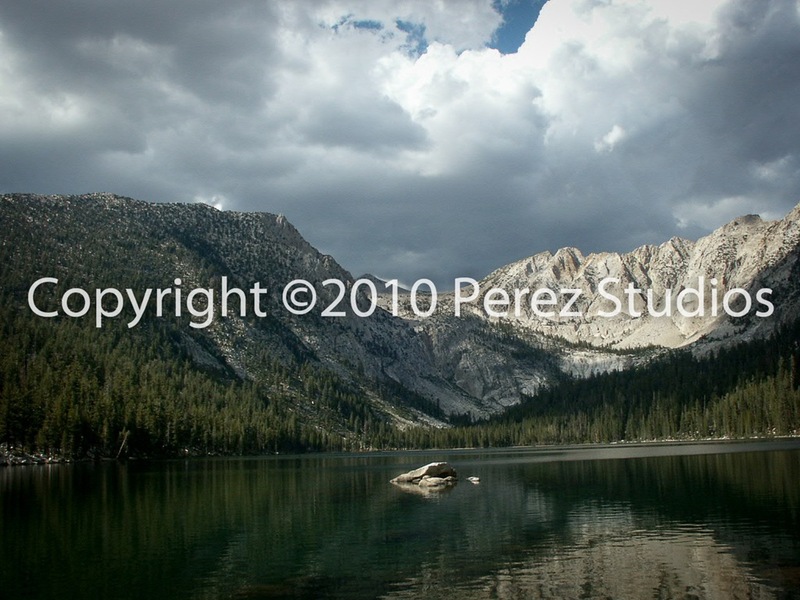 From the John Muir Wilderness area to the Ansel Adams Wilderness it was all amazing places to see. We took the Neon up as far as we could. We stopped at a couple of places along the way. We got to Edison Lake which was just so peaceful. There was only one small boat in the middle of the lake. We drove on and saw that the road was getting rough. We turned back to a small parking lot. We parked and looked at two paths. One said “The Devils Bathtub – 4.5 miles” the other said “Glacier Point – 15 miles”. I asked my wife which one she wanted to take and she laughed. We took the shorter one of course. It was amazing that we didn’t see too many people on this hike. We passed a couple of groups along the way and then it got quiet and I mean very quiet. Finally I was excited to see a man coming down from the trail. I asked him, “How much farther?” and he said, “You are about half way there.” I thought oh my it seems like we had been walking forever and we are only half way there. We continued on not coming across anyone else. We came to about a mile before the finish line when it just seems to go straight up hill. We kept on moving and finally reached the top. Today starts the week of Mexico Photos week, which I mentioned last week that it was a little late but better late than never. This week I plan to take you along on the trip that our family took when we last visited in December of 2004. Today, I am going to share more than one photo with you because Guanajuato, Guanajuato, Mexico is probably one of the most beautiful places to see in Mexico. It has so much history and amazing architecture. The above photo is of the Basilica de Nuestra Señora de Guanajuato which is just one of the beautiful churches that Guanajuato has to offer. 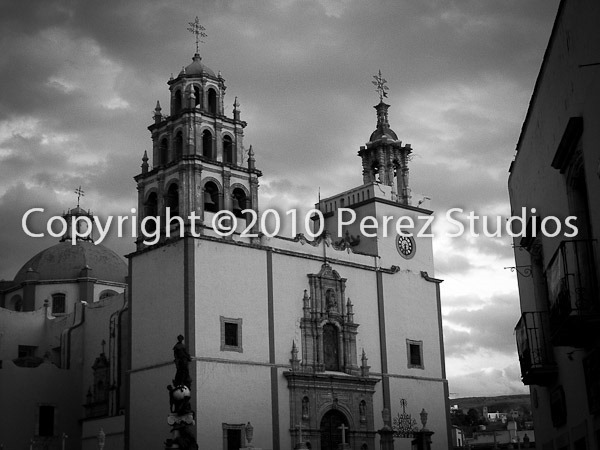 The photo to the right is of another church just to the right of Teatro Juarez. Not sure what it is called but if you know and would like to share with us, please feel free. Guanajuato has so many different places and things to see. It is full of history. According to a custom publication of the Fresno Bee that was published on September 8, 2010, Guanajuato, Guanajuato, Mexico is the 2nd top city next to Ciudad de Mexico. There is so many important history figures that have roamed the streets. 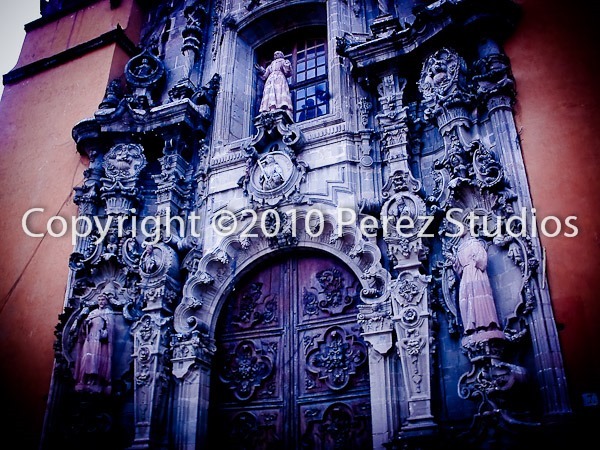 I want to thank The Cultured Traveler for some of their information on the buildings in Guanajuato, Guanajuato, Mexico. Visit their site to see all the information on the capital. Stay tuned throughout the week to see more photos from Guanajuato, Mexico. I am even going to share something that might frighten you! Today is our last day to share my experience of Guanajuato, Mexico with you. I am going to share some photos of Leon, Guanajuato, which is a very large city that has a lot of things to do. Food at almost every corner sold by local street vendors. Tacos al Vapor were just one of my favorites. My wife has a cousin that sells every morning on one of the popular street corners. They have a large variety of tacos. From chorizo to beans and on one of the last days I was there I had him invent something he still sells today. A torta de tacos. We went and bought a couple of bollilos (bread rolls) and opened them up to reveal something like a sandwich. Then we laid a couple of tacos inside the bread and added some cheese and chile and closed it up and it was heaven. There is just so many different things to see in Leon. 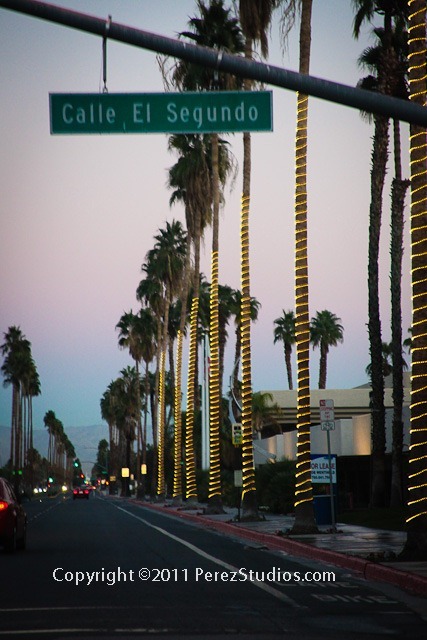 From El Centro (Like the City Mall) to the parks and just the streets. 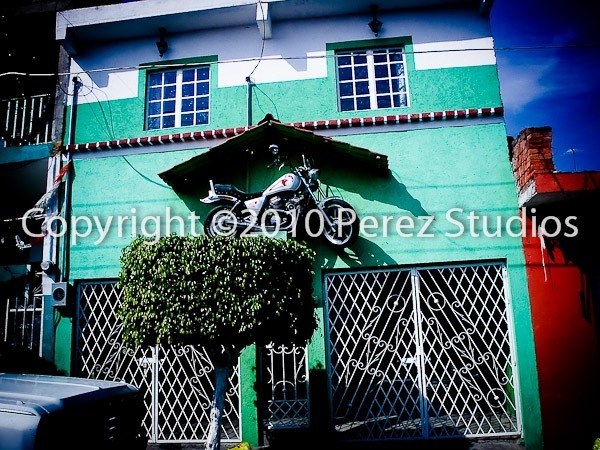 Over on the left you can see a house that has a motorcycle hanging over their front doorway. Interesting. There is even a hill that you can drive up to and see the whole city. It kind of reminds me of Los Angeles. The local vendors have so many ways to make things work and improvise in ways that I wouldn’t have thought of. 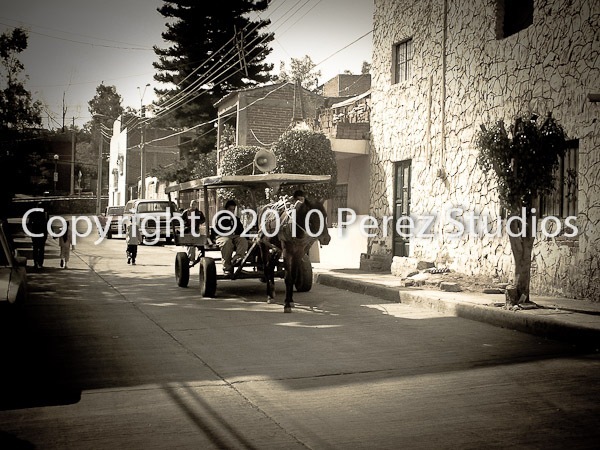 On the right you can see a photo of a vendor that rides a horse and carriage with rubber tires selling fruits and vegetables. They carry a horn speaker and microphone to let people know they are coming. I still remember the propane sellers. They have these large trucks that race through the streets yelling on the horns announcing, “El Gas!”. Since there aren’t any gas lines in the homes they have to purchase propane tanks and the salesman go through the neighborhoods announcing their presence. People that need gas run out to stop them and get their refill. I also remember a scene that I don’t have here but it is still in my mind. The scene of dogs eating crunchy tortillas lying on the floor. I guess since Dog Food is probably too expensive so they just get the leftover tortillas and throw them on the floor for the dogs to eat. Mexico has a lot of culture. One that I miss very much and cant wait to go again. I love getting up early in the morning and heading over to the market to get a fresh milkshake or “liquado” with all kinds of delicious fresh fruit and all the good nutrients a grown boy needs. The market has so many fresh produces. From freshly cut pigs to fresh fruits and vegetables. The market is the place to be, unless you are a pig or other type of animal. 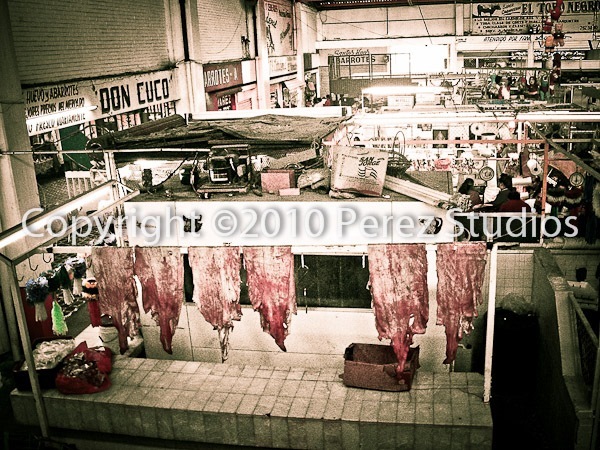 Over on the left you can see a photo from inside the market looking down at some fresh cut pork. They skin the pork to make pork grinds. That is all from my trip to Leon and Guanajuato. Next week I plan to share some more of my photos from other trips. Remember, if you have photos of your favorite Mexican hangout please share them with us and let us know what you love most about Mexico. 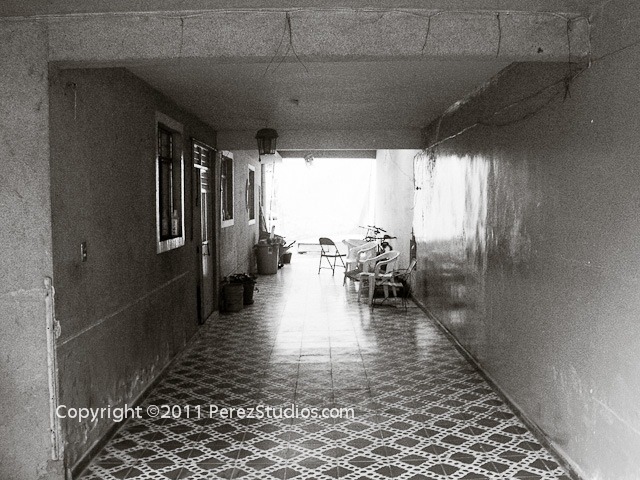 This is a photo of an alley from the city of Guanajuato, Guanajuato, Mexico. This photo is back from 2004 when my family went down to visit the beautiful area. This alley is very tiny though. I am not sure how many cars can fit through here but it is some amazing work that the city has to view. When we visited they were working on rebuilding the streets using stone by stone to give it that old fashioned look and feel. I plan on going back someday soon. Just not sure!